Business news consumers don’t distinguish between screens. They want the best content, with the best user experience, on the best device, at the best time. Last year we began increasing our investment in our app portfolio in order to deliver modern mobile and OTT experiences that provide the latest breaking news and most compelling video and television content wherever and whenever our audience of on-the-go, global business decision makers might be. In 2013, Bloomberg was the first media organization to provide a 24/7 livestream of business news on Apple TV. 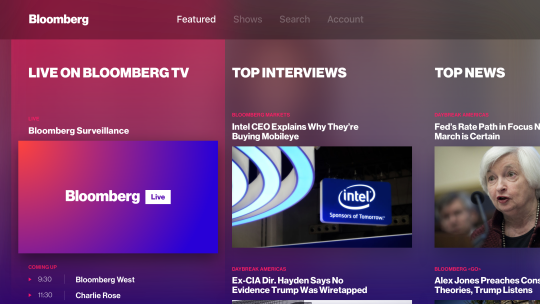 Today, we’re introducing the next evolution of the Bloomberg app on Apple TV, which we believe represents a major step forward for the future of television where there will be a stronger relationship between users and content. 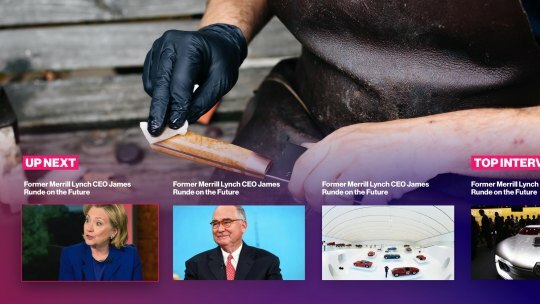 We want to give the power back to you with what we feel is a vastly smarter viewing experience that features new ways to deliver the best of Bloomberg’s news, data and information, along with enhanced personalization. Apple TV presents us with many advantages; one of them being that it’s digital and therefore connected to the Internet, allowing us to provide you with better context, dynamic choices and an enhanced design. Built entirely in-house by a cross-functional team including product, design, engineering, editorial, ad sales and innovation, the Bloomberg app is a completely reimagined experience that blends digital content with live television on top of an intuitive and upgraded UX. We’re also capitalizing early on some emerging OTT trends we’re seeing, such as a greater emphasis on large, beautiful imagery and cross-platform branding. – Streamlined Design and UX: a simplified navigation and menu experience that elevates editorial and personalized content options. – Featured Content Collections: a new way to curate and organize content. Categories include Top News, Top Interviews, Cars and Tech and Digital Originals like our successful global tech series Hello World. – Personalized Content: content recommendations based on prior Apple TV watching history intended to provide viewers with a smarter, more relevant experience. – Live TV Dashboard: data-driven experience that delivers static and contextual information based on what’s playing on live television. For example, if Elon Musk is being interviewed, we’ll present you with the best of Bloomberg news and data to provide more information and context about him and the companies he leads. We’ll also serve you related content when you hit pause. – Universal App Download: Apple users that have enabled universal app download will automatically have our Apple TV and consumer app downloaded on their respective devices, delivering a cross-platform experience. For our advertising partners, we’ve refined our offering, pushing for stronger contextual alignment against the content that matters most to them. With this launch, we’re introducing new sponsored content capability, incorporating custom video, partner branding as part of the UX and pre-roll for VOD content. For the first time, we’re incorporating mid-roll to the livestream feed, which will feature a useful countdown clock to orient viewers so they know when the ad break will end. Our intent is to serve Bloomberg’s trusted and informed global news, information and data in a modern, user-friendly package that makes our audience smarter, faster. We look forward to your feedback. Thanks to the hard work of many teams across product, engineering, sales and editorial.